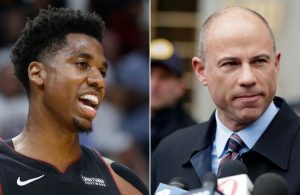 Photo by Associated Press: "Ray Allen led Miami with 15 points in the fourth and not only hit the game winning shot but also had a crucial three point play to cut the lead to 108-106 after getting fouled on a drive to the hoop with 1:33 remaining." 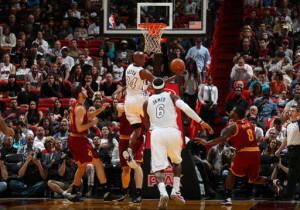 Trailing by two on their final possession, LeBron James drove to the right side of the rim and passed it outside to Ray Allen, the greatest three point shooter of all-time, to knock down the open three with 18.2 seconds remaining. It was the second time this season that James had found Allen for a game winner, as it took a 9-0 run to end the game and the Miami Heat stayed undefeated at home with a 110-108 victory over the Cleveland Cavaliers. “Everyone talks about his shooting ability but it his ability to move and get in the vision of the passer,” Heat Coach Erik Spoelstra said about Ray Allen. After scoring only two points through the first three quarters, Ray Allen led Miami with 15 points in the fourth and not only hit the game winning shot but also had a crucial three point play to cut the lead to 108-106 after getting fouled on a drive to the hoop with 1:33 remaining. 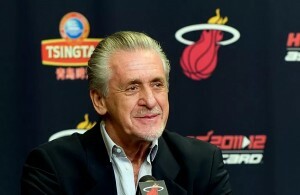 “LeBron is attacking, Dwyane is attacking and I just try to get in position and allow LeBron to find me,” Allen said. After shooting a dismal 1-of-5 from the field in the first half, Dwyane Wade had 18 points but it was his block of Jeremy Pargo with 3 seconds left that sealed the win for Miami. James had 30 points and five assists to lead the Heat and it was the third time he eclipsed the 30 point mark this season. James has also scored 20 or more points in all 13 games this season. Cleveland was in control for a majority of the game, finishing the first half on a 15-7 run, connecting on 10-of-19 shots from deep to extend their lead to 59-48 at halftime. The Cavaliers’ 14 made three pointers was the second most the Heat has given up this year since they gave up 19 to the New York Knicks. But Miami surged back, riding a 13-1 run to cut the lead to 68-67 after a Shane Battier corner three. However, Battier left for the locker room after Udonis Haslem fell on his leg going for a rebound and did not return. On the offensive end, the Heat had nine first half turnovers that led to 14 points for the Cavaliers, four of which were committed by James. James rewrote his wrongs in the third quarter, erupting for 14 points and tied the game at 77 with 45 seconds left in the quarter. The Heat outscored the Cavaliers 23-12 in the third, and erased their 11 point deficit. Continuing to thrive offensively at the center spot, Chris Bosh had 15 of his 23 points in the first half and added 7 rebounds. Bosh also eclipsed the 13,000 career points scored mark, joining four of his teammates in the milestone (James, Wade, Allen and Rashard Lewis). “We got some good stops late,” Bosh said. “We held them to a decent percentage in the second half and kept moving the ball on offense. Coming into the game, Anderson Varejao led the league averaging 14.0 rebounds per game and had seven in the first quarter alone. The energizer for the Cavaliers, Varejao had seven points in the fourth quarter and finished with 10 points 15 rebounds. 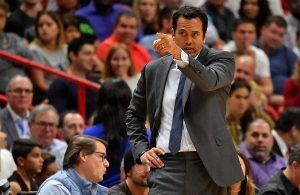 “He’s big, he’s relentless, and he’s tireless when he goes after rebounds,” Heat Coach Erik Spoelstra said about Varejao’s commitment on the glass. 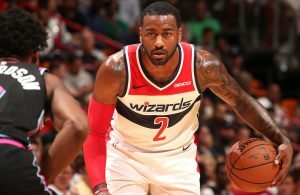 In a matchup against the perennial all-star Wade, Dion Waiters, whose style of play mirrors that of Wade’s, had eight points in the fourth quarter, making shots from the outside as well as in the paint. Waiters, a 20 year old rookie from Syracuse, had 16 points and continues to be the spotlight for the Cavalier’s offense with Kyrie Irving out with a hairline fracture to his left index finger. Filling in for the injured Irving, Pargo started at point guard adding 16 points and seven assists and was one of eight Cavaliers to score in double figures. Miami (10-3) had 18 turnovers, seven at the hands of James, that allowed Cleveland to get 22 points off of those turnovers and kept the Cavaliers in the driver seat for the majority of the game. “We have to do a better job of injecting that intimidation throughout the game,” Allen said. The Heat will have four days to rest until Thursday when they host the San Antonio Spurs.